effect you both on and off line. and we’ll see you on the 9th, at 1830 in MadLab. The proposed legislation will also introduce a ‘double-lock’ on ministerial approval of interception warrants, with a new panel of seven judicial commissioners. But the ‘double-lock’ will not apply in ‘urgent cases’ and security services will be able to spy on the content of people’s conversations and messages without a court-approved warrant. Last time we were talking about ways to explain your concerns to people like your local MP. For the final event of the year we want to get your feedback on how that worked out – did you manage to speak to your MP (how could it be made easier ?) and if you did manage it, how did it go. It’s on Wednesday, December 16 at 6:30 PM at the MMu’s new Birley campus, room BR G.16. We’re trying a new venue as well, so please check the event’s detail pages on http://www.meetup.com/ORG-Manchester/events/227021928/ for details, or to make a small donation even if you can’t attend so we can continue to offer these events in future. 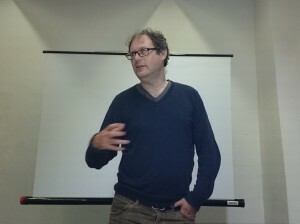 Earlier in the week we had the pleasure of entraining Jim Killock, ORG’s executive director, ahead of a workshop on talking you MP about intrusive surveillance. Episode V: The Snooper’s Charter Strikes Back! great events in one fantastic evening for our October Manchester Meetup. attend, donations on the night are welcome. Both events are on the evening of October 5th, in MadLab, Manchester. More details are on MeetUp. We’ll be running a workshop on how you can talk to your MP. You’ll come away from the workshop ready to talk to anyone about surveillance! You are welcome just to turn up on the night of course, so see you there ! Last nights very well attended talk covered an introduction to some of the worst abuses of our rights and privacy conducted by the UK and other governments, from hacking into the computers of our allies to indiscriminatingly recording every Yahoo video chat. If you can use mass surveillance to spy on everyone, why bother sorting out child poverty or other issues abroad? ORG’s Executive Director Jim Killock will talk about mass surveillance, liberty and activism. He’ll say why mass surveillance is a danger to democracy and how we can work together to curb it. This event is free and open to the public. You don’t need to be an ORG member to attend, just someone interested in an open and free internet. 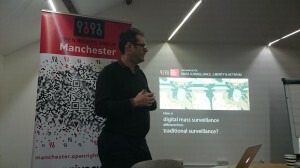 If you don’t want to use Meetup you can email manchester@openrightsgroup.org to RSVP. Arrive from 7.15pm onwards for a 7.30pm start. The Don’t Spy On Us event last month was very well attended, and was standing room only ! Tom Watson told the meeting how he had not been aware of GCHQ’s alleged mass surveillance of email metadata revealed by Edward Snowden when he had been a defence minister, or when he had been at the Cabinet Office. He said his colleagues in the Labour Party were deeply suspicious of his stance on mass surveillance. I came across http://www.vpncompare.co.uk/org-manchester-surveillance-debate-21-sep-14-report/ too. The event overall was insightful and well worth attending, the Open Rights Group and other panel members groups aims are commendable. Were you there ? Tell us what you thought ! On Tuesday, October 7 at 7:00 PM we’re delighted to be putting on a joint event with the Manchester Literature Festival. 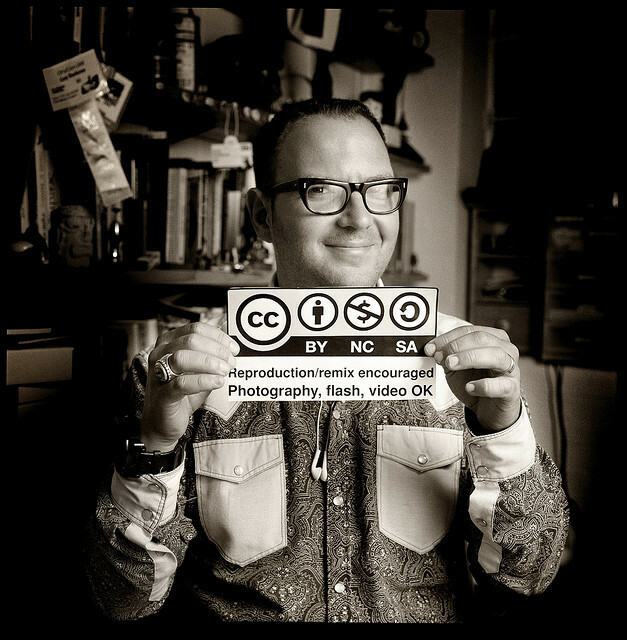 Author, activist (and ORG Advisory Council member), and journalist Cory Doctorow takes you through three simple rules for evaluating digital business models for creative people, and explains how the choices you make about your digital creativity resonate through the whole web of the 21 century’s electronic nervous system. There will also be a chance to ask questions, and buy his books..
Tickets are limited, but I’ve managed to grab us a decent sized room in Waterstones on Deansgate.